Fridgeezoo Fridge Pets “live” in your refrigerator, you see, and only pipe up when you open the door. You might be greeted by a deep-voiced, gruff old Polar Bear or a feminine frosty-white feline. Ever had a Walrus greet you with a jolly “Hallo!”... no? 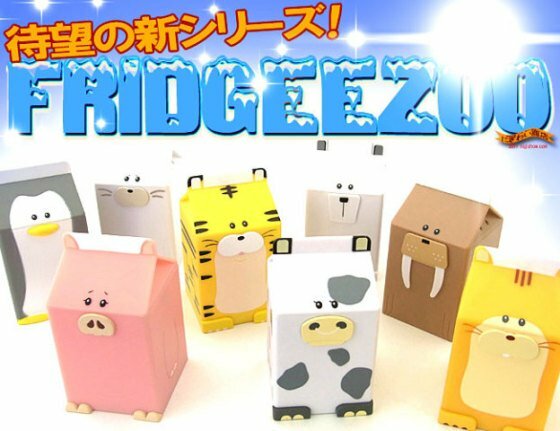 Not to worry, there's sure to be a Fridgeezoo Fridge Pet with your name on it. 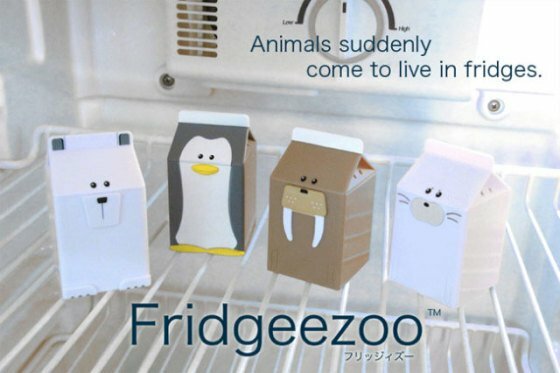 Fridgeezoo Fridge Pets come in 8 different varieties, each one shaped roughly like a milk carton - the better to blend in, perhaps. Choose from Walrus, Cow, Pig, Squirrel, Tiger, Penguin, Polar Bear and Seal. Fridgeezoo Fridge Pets just love to make small talk (in Japanese) while you're wondering what combination of questionable leftovers would go best in a hero sandwich at 2am. Leave the fridge door open too long, however, and you'll get a scolding from yuor leetle friends: Fridgeezoo Fridge Pets, you see, are champions of conservation and will coax you to change your energy-wasting ways. Consider that REAL Polar Bears, Penguins, and other Arctic and Antarctic creatures are suffering from the effects of Global Warming, which only the willfully blind nowadays refuse to ascribe to human activities. So listen up, shut the fridge door, save some energy and... maybe try exercising if you need to exorcise your insomnia. Fridgeezoo Fridge Pets weigh 42 grams (1.5 ounce) each and are made of ABS plastic. Every pet measures 7cm by 4cm by 4cm (that's 2.8” x 1.6” x 1.6” for you non-metric folks) and three LR44 button batteries (included) give 'em life. You can get a Fridgeezoo Fridge Pet of your very own by ordering online at Amazon.